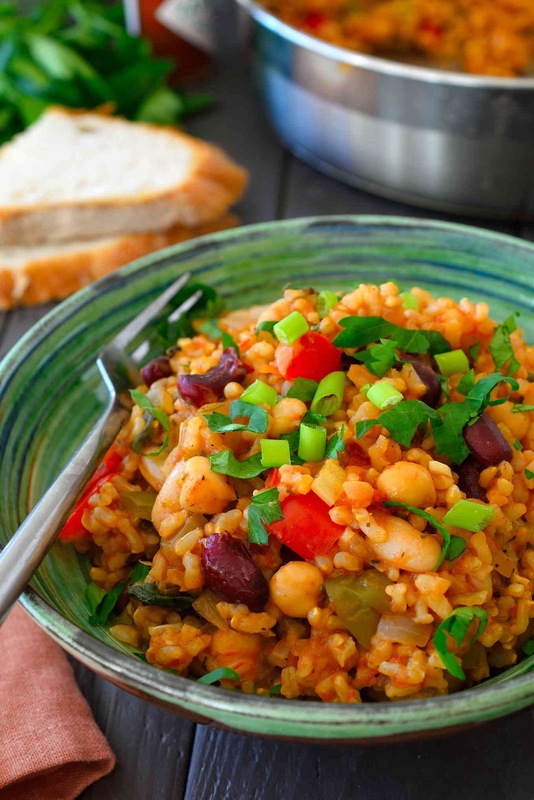 This vegan jambalaya recipe is super easy to make with basic pantry staples. Tomato-y rice flavoured with loads of herbs and spices and bulked up with celery, peppers and a selection of mixed beans make a hearty, warming and filling quick weeknight lunch or dinner. Heat a large pan over medium-high heat and add a splash of water or a tablespoon of oil. Add the onion, and garlic and sauté until soft. Add the celery and peppers, and another splash of water if necessary, and sauté until just beginning to soften. Add the crushed tomato, vegetable stock, herbs, spices and sauces (except the salt) and rice. Bring to a boil then reduce the heat to low and cover the pan. Simmer gently until the rice is cooked and the liquid is absorbed – 30 to 40 minutes. Keep an eye on it near the end of the cooking time and stir from time to time to prevent the rice from sticking. Once the rice is tender, stir in the beans and taste. Add salt if necessary. Give it a minute for the beans to heat then serve the jambalaya with fresh chopped parsley and green onion sprinkled on top and more Tabasco sauce on the side for those who like it really spicy. This post contains affiliate links which help to offset the cost of running the blog with no additional cost to you. 0 Response to "Vegan Jambalaya"